Hard drive running low on disk space? There are programs that will go through and empty your computer’s cache and temporary files. The problem is you may still have a bunch of unnecessary files taking up space. To identify these culprits taking up disk space, I recommend downloading WinDirStat, which stands for Windows Directory Statistics. After running the analysis, I found a ton of both automatically saved files and forgotten files generated from my screen recording software, GoPro Studio and VMWare—I was able to clear up 80GB of disk space. Disk Inventory X is the alternative for Mac and KDirStat is the alternative for Linux. 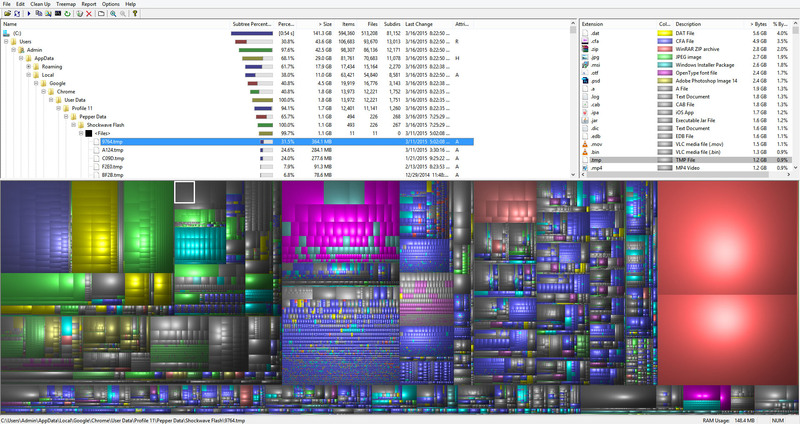 WinDirStat creates a tree map of your hard drive where items that take up large amounts of disk space are take up more space on the map visually and vice versa, giving you a visual diagram of your hard drive space allocation. You can click into the large blocks and if they are files that you no longer need, you can right click, go to Explorer Here and then delete the file.